We know we should teach our students to be creative, but how do we do it? Creativity sometimes seems like this odd, elusive thing that only the most brilliant of artists possess. Even the idea of "teaching creativity" seems counterintuitive: isn't it something we either have or we don't? But creativity is something that can be learned and nurtured, and the best place to start is with the most basic formula for being creative: "Gather. Store. Recombine." I first found the idea of "Gather. Store. Recombine" in the writings of a Disney Imagineer on how they come up with new ideas for shows, stories, rides, and experiences in Disney's theme parks. It's further used on the E82 blog in a series of posts called "A History of Imagination." But whether or not creative people are using these three words as they write about their process, the structure of creativity stays essentially the same. The idea behind it is very simple. People that we consider to be creative, the ones who create unique and novel things, engage in three simple actions: gather as many ideas as possible across different domains of knowledge, store them for future use, then recombine them into something new and unique. When looked at through this lens, instead of sitting and waiting for an ephemeral "Eureka!" 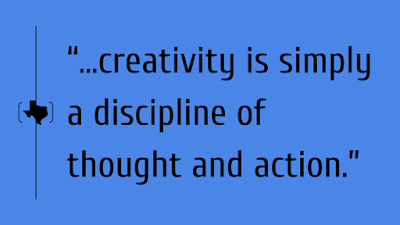 moment to hit, creativity is simply a discipline of thought and action. This is the goal of the STEM/STEAM movement, where schools work to pull down the walls that separate their isolated course offerings to create a coherent whole. Within this whole, ideas from any discipline can be used in another. Want to use advanced mathematics and the laws of physics to create a player piano with marbles and aluminum? Do it! Curious how a stop-motion animation of the development of platypus adaptations would look rendered in a neo-Cubist style? Go for it! In recombining previously disconnected ideas, we discover new ways of looking at the world. In our new way of looking, we discover even more connections, leading us to more unique and elegant solutions. Creativity breeds creativity. It's our responsibility, then, to teach students the habits of thought that lead to creativity. So how do we do that? Here are a few suggestions for helping students unlock their creative potential. Encourage students to read widely. Don't limit students to what you think they should read. Expose students to a multitude of expository texts, especially at the elementary grade levels where fiction can be dominant. Show students real-life examples of engineers, scientists and artists coming together from different disciplines to solve otherwise unsolvable problems. Explain how NASA is combining origami and rocket science to get solar arrays into space. Reinforce the importance of always being curious by beginning each school day with a "Wonder" from a site like Wonderopolis. Emphasize to students that ideas to solve anything can come from anywhere. Help students develop a strategy to organize information and ideas by giving them options. Scrapbooks? Journals? Google Keep? Diigo? 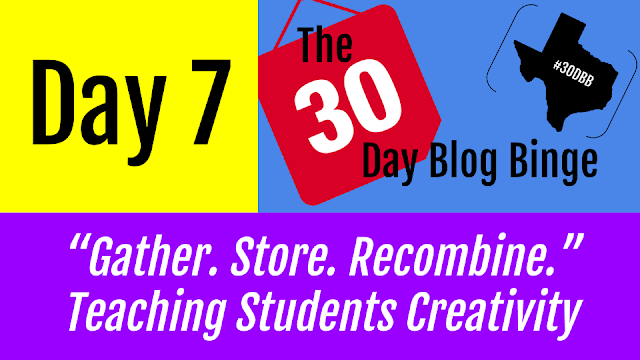 The way in which ideas and information are stored will have an impact on the connections students can make. Do they store it visually, with overlapping domains in the same place, where it's more likely for inspiration to hit as they see a brand new connection? Use a site like Padlet for students to collect a diversity of ideas they think might help them solve a problem they're facing so they can more easily see relationships between ideas. Encourage students that however they choose to store information, they need to periodically go through it again. As they find new information and ideas, it will start to change how they view what they've gathered before. Ask: "Is there a way to use _______ in a way it's never been used before? Can you take _______ apart and use the parts for something different? What if a young child looked at _________? How many different uses do you think they could come up with for it?" Encourage students to "embrace something absurd" as they put things back together. Make a point of asking how ideas in another class they're taking might solve the problem they face in yours. Especially ask them when you don't know the answer. Always keep in mind that recombining takes boldness to suggest something new and unique, so make sure your classroom is a safe place for students to take those kind of creative risks. Of course, creativity will never be boiled down to a formula. But as we strive to give students a framework for solving the problems they'll face in the future, I'm convinced that "Gather. Store. Recombine." 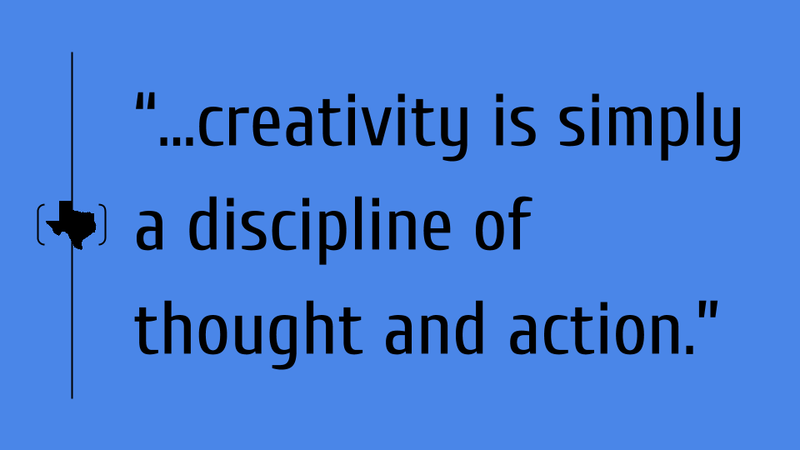 is one of the best structures there is to start nurturing those creative habits now. WDD is very progressive online channel for here support in many ways.I got to read its motives and I liked the ideas very much.I appreciate their efforts. You can now easily conduct the job search in this field to get the final meaning of your life. Get more links of the academics and read this post the new package for your career. You can also see the link of the tutions and the best Aid in this field. Your ideas have made it different for me.I was so worried about my visit this site interview questions but your post really helped me a lot.Thank you so much. Stem is becoming powerful program in all over the world. Every school is working on STEM project because there is so many scope in it. So on this website i also read what is important for me so thank you so much. Teaching creativity is one of the most demanding factor. In my blog i can relate what is necessary for the stduents.